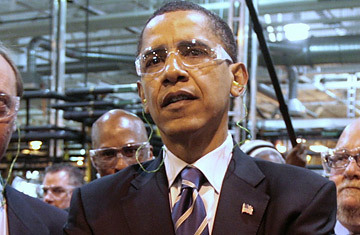 Presidential hopeful Barack Obama tours the Chrysler Stamping Plant in Sterling Height, Michigan, on Wednesday, May 14. In case you missed it, Barack Obama's American flag lapel pin is back. How long it will stay on is anyone's guess. This week, after eschewing the patriotic symbol for quite some time, Obama started wearing the pin to selected events. On Tuesday, he was sans pin on the Senate floor, but then later donned it while speaking to working-class voters in Missouri during the evening. "I haven't been making such a big deal about it. Others have. Sometimes I wear it, sometimes I don't," Obama said. "We were talking with a group of veterans yesterday. Over the last several weeks people have been handing me flag pins. I thought it was appropriate." Asked if he will continue to wear the pin, Obama said, "If it ends up being on another suit, I might leave it one day, but it's something that I've done before and I'll certainly wear it again." Obama may make it sound like just a random fashion choice, but there is a large swath of Americans who take symbols like the pledge of allegiance, the national anthem, and, yes, the flag in its many iterations very seriously. And, as former Clinton adviser Doug Schoen pointed out in an op-ed in the Wall Street Journal this week, these are people  mostly white working-class folk  whom Obama can ill afford to offend given his losses in Ohio, Pennsylvania and West Virginia. The pin saga started on October 3, 2007 when a local ABC reporter asked Obama why he didn't wear one. Instead of the standard Beltway refrain, "My patriotism speaks for itself," Obama launched into a long explanation of his decision-making process: "The truth is that right after 9/11, I had a pin. Shortly after 9/11, particularly because as we're talking about the Iraq war, that became a substitute for, I think, true patriotism, which is speaking out on issues that are of importance to our national security," Obama said in Cedar Rapids, Iowa. "I decided I won't wear that pin on my chest. Instead I'm going to try to tell the American people what I believe what will make this country great and hopefully that will be a testimony to my patriotism." It didn't take long for opponents and Republicans to jump on the idea that Obama wasn't as patriotic as he could be, prompting the Illinois Senator the next day to clarify his remarks. "After a while, you start noticing people wearing a lapel pin, but not acting very patriotic. Not voting to provide veterans with resources that they need. Not voting to make sure that disability payments were coming out on time," he told a crowd in Independence, Iowa. "My attitude is that I'm less concerned about what you're wearing on your lapel than what's in your heart." The furor died down and Obama went pin-less for the better part of six months until April 15, when a veteran in a town hall meeting outside of Pittsburgh handed him a pin and asked him to wear it, which Obama did for the rest of that day. The reemergence of the pin led to a much-ridiculed question on the issue at a much-ridiculed ABC debate later that week. "I have never said that I don't wear flag pins or refuse to wear flag pins," Obama explained. "This is the kind of manufactured issue that our politics has become obsessed with and, once again, distracts us from what should be my job when I'm commander-in-chief, which is going to be figuring out how we get our troops out of Iraq and how we actually make our economy better for the American people." Obama is not the only candidate to wear the pin intermittently. Rival Hillary Clinton is often without it. When asked she simply says, "There are many ways to show your patriotism." The only G.O.P. candidate to wear the pin faithfully was Rudy Giuliani. Is it fair that Obama is singled out for pin scrutiny? Probably not. But it's likely that Obama's pin will keep sticking him until he brings some consistency to his lapels.